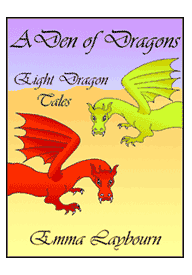 THE WINTER DRAGON - one of a free ebook collection of online dragon stories, only from Megamouse Books. High on a cliff, overlooking the plain, the dragon Inferna had her nest - if nest was the right word for a few rocks balanced on a windy ledge. In it were four large, pointed eggs. Over the years, the people of the scattered villages below had grown used to Inferna's presence. It was something they had learned to live with. Once in a while, to be sure, some brave and foolish youth might vow to climb the cliffs in spring and destroy the eggs before they hatched. And once in a while, his broken body might be found at the bottom of the cliff-face - or never found at all. So, on the whole, the nest was left alone. This spring, the dragons hatched as usual: two males and two females. Inferna, their proud mother, watched the babies stumbling around on the rocky ledge. They were ungainly and quarrelsome, and already very strong. As soon as they could speak, the baby dragons told her their names. "Ferox," snarled the biggest, a handsome rust-red male. "Atrox," croaked the other male, long and sinuous and orange as a flame. "Dura," growled the third, a muscular green female. "Nivalis," breathed the fourth, so softly that her mother could barely hear. She bent her head down to her daughter. "Nobilis?" she asked her hopefully. "Mirabilis?" "Nivalis," whispered the baby dragon. Inferna had never heard this name before. This did not surprise her; she had never seen a dragon like Nivalis either. For her daughter was the colour of a cloud. She was not quite white, and not quite grey. Her eyes were of the same uncertain milky colour as her scales. When Inferna looked down at her own fiery red skin, and remembered the babies' handsome green father, Noxius, she could not understand it. Still, what did it matter? All four dragons were healthy and growing fast. They were always hungry, so that very soon Inferna was hunting night and day to keep up with their appetites. Luckily the baby dragons were not fussy. They would eat anything that ran or hopped or flew. Only Nivalis was proving awkward to feed. When the others tore enthusiastically at a lamb's carcass, she would pick at it half-heartedly. She preferred her meat cold-blooded: snakes, lizards and especially fish. As the dragons grew bigger and the nest more crowded, the other three started to complain about Nivalis. "She's always cold!" whined Atrox. "She makes me shiver!" "Move over, then," Inferna snapped. "Dura won't give me room!" "I'm not going next to Nivalis," grunted Dura. "She chills me right through." "I'm not," declared Ferox, "because I'm the biggest." Atrox bit him. So it went on. Atrox tried to push Nivalis out of the nest when nobody was looking: but she gave him such a raking with her claws that he did not try again. As they grew larger, the young dragons grew noisier as well. The evening air was filled with their harsh screeching as they tried out their voices. But the voice of Nivalis was as thin and clear as glass. By early summer they were testing their wings, bounding up and down on the edge of the nest. It was none too soon for Inferna. She was exhausted by their ravenous demands. The sooner they could fly and hunt down their own food, the better. Perching on the cliff-top, Inferna scrutinised the plain below. She saw tangled thickets hiding deer: coppices where the wild pigs scratched: and deep woods, where the wolves ran. Plenty of good food. However, the forests could be dangerous - even for a dragon. They harboured giants and gryphons, witches and wodwos. So she preferred to hunt in the open fields around the villages, where men fattened their sheep. Inferna's favourite village was called Great Toft. She regarded it as entirely her own territory, and fought off any dragons that came near. Next year, when her babes were fully grown, they would have to find new territories of their own. However, five miles to the east lay another village, Little Toft. There had been no dragon there since old Belliger had died, years ago. Her little ones could practise hunting there, she decided. There were plenty of cows and sheep, and the villagers were as soft as butter. It would keep her fledglings out of her way, and the strongest of them could eventually take the village over. She hoped it would be Ferox. He was her favourite. Brand the Blacksmith of Little Toft was hard at work. He glistened with sweat as he bent over his anvil, hammering. His son Walter watched him, half-hypnotised by the heat and the steady clang of his father's hammer. Straightening up, Brand dunked the red-hot iron into a bucket of water which sizzled and steamed. "Take those spears to Weaver's house, while I get on with Merchant's. Much good they'll be - Merchant won't know what to do with a spear. Still, who am I to argue?" He wiped his face and neck on a cloth. "And George Farmer's got some daft idea about an iron fence. How is that going to keep a dragon out, I ask you?" "At least these dragons are good for business," volunteered Walter timidly. He was somewhat scared of his father and of the raging heat of the forge. "I'd rather have no business and no dragons. We've had no dragons at Little Toft these ten years, and we don't want them now." "But we've often seen dragons flying around," said Walter rather wistfully. "That's different. They weren't staying. We don't want dragons moving in." Walter did not argue. He hefted the spears and went out of the forge into the cool, clean sunshine. Weaver was not at home. He was probably at the market, but Walter decided against trying to find him in the heaving crowds of the market square. However, he could not just leave the spears, so he sat down by the front door to wait. Closing his eyes, he let the sunlight shine red through his eyelids. In his imagination he saw the line of four dragons sweeping across the sky, just as he'd seen them last week: straight and swift as arrows shooting overhead. They had been wonderful. The hubbub of the market turned to sudden cries of alarm. Walter opened his eyes, and beheld the dragons of his dreams. His heart leapt as they streaked out of the clouds, blazing red, dazzling orange and iridescent emerald green. But the last one was a strange grey colour; he wondered if there was something wrong with it. The dragons circled high over the market square and screamed. Down below the villagers screamed too, and yelled and shook their fists and anything they could lay their hands on: brooms and rakes and crutches. They threw stones and pots and potatoes up at the dragons - pointlessly, since these hurt nobody but the unfortunate people they came down on. "Why all the fuss?" asked Walter. "They've hurt no-one except a couple of sheep." "It starts with sheep," answered an old woman nearby, busy banging on a kettle with a wooden spoon. "They're only young." Like me, thought Walter, as he dodged a flying potato. "But they're so magnificent," he said. "You won't remember." She stopped banging for a moment. "You've never seen what a dragon can really do. To horses, cows - and people. We want to get rid of these dragons before they get any bigger." By banging on a kettle? wondered Walter. She pointed up triumphantly. "Look! They're leaving." The dragons were circling higher now. She shook her fist at them. "Go on, then, you vermin! And don't come back!" The villagers cheered as the dragons soared upwards, shrinking. The higher they rose, the lower Walter's spirits sank. He was bitterly disappointed to see the dragons go. Then the biggest one - the red one - seemed to change its mind. Folding its wings, it dived out of the sky like an angry falcon, making the air sing. As it fell, it unfurled its talons, curved and cruel. It banked above the schoolhouse and raked its claws across the roof. All the villagers ducked instinctively, apart from Walter. He was the only one to see the dragon draw in its breath and open its jaws wide to scream. But instead of the expected scream, a long funnel of flame came out. It was hotter than his father's forge. It hit the door of Weaver's house, which smoked, turned black and went up in a roaring mass of flames. Walter was the only one to see the expression on the dragon's face as it turned and wheeled back upwards. He thought it looked almost as surprised as he was. Ferox had just discovered how to breathe fire. "We'll never get rid of them now," said Walter's father gloomily, tossing pebbles into the duck-pond. "Not now that the orange one and the green one have learnt to breathe fire too. There'll be no stopping them." "The fourth one can't fire-breathe yet," said Walter. "The grey one." "What does that matter? Three are bad enough. Cornfields, haystacks, sheds, roofs, barns - nothing will be safe. Look at them," said Brand grimly. Two dragons spiralled high: one emerald green, one grey, almost lost against the clouds. The green one swooped at a patch of woodland nearby, breathing a funnel of fire. The treetops burst into flame, causing half a dozen terrified deer to bound out from their cover. The dragon dived and plucked a faltering deer from the ground. Then it took off across the fields, leaving a blackened trail across the wheat. "It's nothing to them," said Brand. "Just wait until harvest. Every sheaf, every bale. We may as well not bother." Now it was the grey dragon's turn. It plunged down - not at the trees, but straight at them. Walter heard the hiss of wind through its wings, before his father grabbed him and pulled him flat on the ground. There was a high-pitched shriek, a tremendous splash, and a great quacking of panicky ducks. Cautiously he raised his head. The grey dragon was gliding away, a large fish squirming in its jaws. "At least it can't set the duck-pond on fire," said Walter. "I've seen a dragon fry fish in a pond before now," answered Brand. Walter got up and walked to the water's edge. There were no ripples. The pond had an odd sheen. Then he saw the indignant ducks skidding across its surface. Brand poked it with a stick. Cracks spread across the pond, drawing a glittering maze. "Well," said Brand, and did not seem to know what to say next. "It breathed ice," said Walter. "Ice!" He picked up a piece of pond and held it, staring after the dragon, until his dripping fingers burned with cold. However, one dragon that breathed ice did not compensate for three that breathed fire. It was a novelty, certainly. The villagers now had ice at hand whenever the grey dragon went fishing: it was useful for keeping the butter cold and the milk fresh. "But what good is that," said Brand, "when the others keep eating our cattle? We'll have no butter nor milk soon." At harvest, Walter saw his father's worst fears confirmed. The dragons turned the hayricks into blazes that fired up spectacularly for a few hours and then kept smouldering for days. The air was permanently fogged with smoke, so that people went round with red-rimmed eyes, and coughing. "But then we don't need the hay," observed Brand bitterly, "since we've lost the animals to feed it to." House after house was abandoned as the roofs went up in flames; there was no straw to re-thatch them. Several families camped inside the school house, which was tiled. Miller's waterwheel, damp though it was, became warped by the dragons' heat. It groaned and stopped. "What's the difference? There's little enough corn to grind in any case," Brand muttered. Summer wilted into autumn. The villagers guarded their few remaining livestock like their children, bought expensive grain from neighbouring towns, and worried about the winter. But as the weather grew colder, the dragons visited the village less often. "What's happened to them?" asked Walter, peering out of the forge. The sky was full of orange and scarlet, leaves flying on the wind: but no dragons. It had been a full week now since one had last appeared. "They sleep through the winter, so it's said," Brand told him. "Nobody knows where." "Oh... Then we'll be all right now," said Walter, trying to sound cheerful as he knew he ought. But Brand did not sound cheerful. "They'll be back, come spring," he answered gloomily. "We can survive one winter. But how many more summers can we last?" Deep in the rainy mountains to the west, a great cavern lay hidden underground. It was here that the dragons slept. As the rain turned to sleet and the sleet to snow and hail, more of them gathered from far and wide. They lay in slumbering heaps, claws entangled, tails entwined, old enmities forgotten for the sake of winter warmth. The air inside the cavern steamed and smoked and reeked of sulphur. Amongst all the sleepers, though, one dragon was restless. Nivalis shifted and rolled over, unable to sleep. She was too warm. She'd been pushed to the edge of the cavern by dragons complaining of her chilliness; but even by the wall she was too warm. The smoky heat of her fellows was stifling her. It was hotter than the summer sun had been - and in the summer, she'd at least been able to cool herself by plunging into ponds and lakes. The memory of that cool water made the cavern's heat too much for her to bear. Nivalis began to creep slowly and carefully away from the sleeping dragons. She felt her way along dark passages of stone, following the cold call of the winter air. She emerged on a ledge high up on the mountainside. The sky was a heavy grey and snow was softly falling. Nivalis breathed in deeply. The icy air filled her lungs and rushed through her blood. She unfurled her wings and stretched them wide, letting the cold snow caress them. Then she opened her mouth and cried in sheer pleasure at the cold: a long thin cry like the wind that echoed round and round the icy mountains. No answering dragon cried back. Nivalis was alone. And she was suddenly very hungry. Trudging home heavily from school, Walter glanced up to see a dragon burst from the clouds in a swirl of snow. It swept across the fields like a great grey blizzard, leaving behind it a trail of dead grass encrusted and brittle with frost. Walter raised both his arms and yelled with delight; and the dragon wailed back. The villagers of Little Toft, of course, were less than delighted. They did not know what to make of the dragon's return. At least this one posed no danger of fire, and little risk to the remaining livestock - for the dragon preferred fish from the duck-pond or the nearby lake. All the same, a dragon was a dragon, and they were wary. Very soon their dark mutterings were justified. For it became clear where the danger of Nivalis lay: not in fire, but in ice. She could do the work of a dozen hard winters rolled into a minute. Though she could not burn thatch, tiles shattered under her freezing breath. She breathed down chimneys and put fires out. She froze the log-piles solid. Snow began to fall softly whenever she flew overhead. The villagers shivered by day and by night. The baker could not keep his ovens hot, so there was no bread. Water froze in pails, and milk in churns. And at the blacksmith's forge, the furnace was extinguished and could not be relit. "We've got to do something!" said Walter. "But what?" said Brand listlessly. The fire in him had gone out along with his furnace. He looked small and grey and weary. Walter had never seen him like this. "Don't worry!" he told Brand. "I'll go and talk to this dragon." "Talk to a dragon!" Brand was jolted out of his apathy. "You can't just go and have a little chat with a dragon!" Walter didn't see why not. "Well, it can't burn me up," he said, "and I doubt if it'll eat me, since I'm not a fish." "It could freeze you to death!" Brand struggled to his feet. "I forbid it," he said hoarsely. "You're my only son, and you are not to talk to dragons. Do you hear me, Walter?" "I hear you," Walter said. Walter wrapped up well. Since his father thought he was going to school, he had to smuggle the extra clothes out of the house in a bulging school-bag. Once he was well away from the house, he headed to the lake. Here, he stopped to put on two more pairs of trousers, two pairs of socks, an extra tunic, a woolly waistcoat and two overcloaks. By then he was so bundled up, he could hardly move. He wrapped a scarf around his head and waddled down to the lakeside. The marshy ground was as hard as stone, with clumps of reed poking sadly through the frozen mud. A few snowflakes were blown around in the bitter wind. Even inside all his layers, Walter began to shiver. He stamped his feet and squinted at the sky, wondering how long he would have to wait. Not long. Out of the clouds it fell without warning. It must have been up there all along, perfectly camouflaged. Wings folded, it dived straight at the lake. It crashed deafeningly through the splintering ice and disappeared underwater. Walter gaped at the swirling waves for a long minute until the surface exploded and the dragon re-emerged with a large pike thrashing in its jaws. As the waves settled, long fingers of ice were already groping across the water's surface to lock it up again. The dragon landed on the shore close by and shook itself. Walter was sprayed with hail. As the dragon began to tear at the fish, he approached it cautiously. It glanced up. "Human," it said without interest, in a thin, distant voice. "I'm Walter. I'd like to talk to you." The dragon gulped down the head of the pike. "So talk," it said. "My village," corrected the dragon. "But it's no use to you! You only eat fish. Why can't you leave us alone?" "You're my village, for now at least," repeated the dragon in its chilly voice. "A dragon has to have a village. My mother told me. You're my territory. Do you think I like the place? Ovens everywhere, and horrible warm smoke coming up the chimneys." "Is that why you keep putting all our fires out?" "Of course it is!" the dragon said. "I hope I'm causing plenty of terror and hardship? Because that's what I'm supposed to do." Walter opened his mouth and closed it again. "Well, actually," he said slowly, "actually, we're quite enjoying it." The dragon dropped its fish and fixed him with an incredulous glare from its icy grey eyes. "Well, we like skating," said Walter. "And we like, er, making snowmen. And we can have ice-cream every day. And the butcher's ice-house is already full for the summer." This last fact was true, at least. "Oh, yes, we like the cold." "You like it!" hissed the dragon. A blast of freezing air nearly bowled Walter over. He blinked as ice-crystals formed on his lashes. "It's wonderful!" He tried to sound convincing. Although his mouth was so numb he could barely speak, he went on: "It's such a change from the usual sort of dragon." The dragon drooped its head. "And I thought you were all wretched and terrified," it sighed. "I'm no good at this. What use is it having a village if I can't terrorise it?" The dragon sniffed. "If nobody's afraid of me, I may as well go," it said tragically. Even though this was what he'd aimed for, Walter felt sorry for it. "Where will you go to?" "I shall have to find another village." It sniffed again. "And you'll get another dragon." "Oh, yes. A village has to have a dragon, just like a dragon has to have a village. One of us will take you over. My mother said." "I know she wanted my brother Ferox to have you. The strongest and most fearsome, she told us. I rather hoped it would be me." Its wings wilted. "Ah, well. Maybe it will be Ferox after all. Though Atrox is definitely more fearsome." "Atrox? Which one is that?" "The orange one. He's got a temper. Still, that's not my problem." The dragon began to flap its wings, preparing to take off. "Stop! Wait!" cried Walter. "Just a minute! If you won the village, would Atrox stay away?" "They all would," it whispered. "They'd all have to find somewhere else." Walter chewed his lip. "But how do you prove that you're the most fearsome dragon? I mean, apart from eating everybody up?" "Erch! Eat humans?" spat the dragon. "No, thank you. Though I'm sure Atrox would gobble you up if he got the chance." "Then he mustn't get the chance!" said Walter urgently. "How else? How do you decide?" The dragon pondered long and hard. "Poems," it said at last. "So my mother told us. The most dreadful dragons have long poems written about them. Epics to enthral kings, and appal children on dark nights. That is how the fame of dragons spreads." "I see," said Walter. "Yes. Thank you. Don't go away, will you? I'll be back." Walter went back home and told his father, and Brand, once he had closed his astonished mouth, called a meeting of the villagers in the schoolhouse. There it was decided that a winter dragon was far preferable to a summer one, and that they should try to keep Nivalis. Then all those who could read and write (mainly school-children) put their heads together to compose the dragon's poem. In its accursed and frozen thrall. Even though it had been written in a hurry, the school-children were very proud of it. It harped on a great deal about the ferocity of the dragon and the misery of the villagers. When Walter read it aloud to the grey dragon the next day, it took him the best part of an hour. Nivalis was delighted. "You make me sound quite horrible!" "Good. We're going to send copies to all the other villages," Walter told it. "Do you think that will do the trick?" "If it doesn't, I don't know what will. It says such flattering things about me!" The dragon twirled her tail. "Do I really give all the children nightmares?" "Dreadful ones," Walter assured her, and went so far as to clap her on the shoulder. This was a mistake: his hand froze onto the dragon's scales, and bled when he eventually managed to pull it away. Spring came, despite the dragon, and the lake gradually thawed out with a great cracking of ice. Ferox, Atrox and Dura awoke and came flying out of the mountains, trailing smoke, each intent on laying claim to Little Toft. When they learnt of the epic poem, they were furious. They spat sparks and fizzed fire: but the poem was now famous throughout the land, and Nivalis was notorious as the Scourge of Little Toft. "I don't care," grunted Dura. "It's only a common little village anyway. I can do better than that. I fancy a castle." "I'm going to look for a proper town," said Ferox. "Somewhere with a few knights, a bit of excitement." Atrox hissed in anger and thrashed his tail; but there was nothing he could do about it. So when the others departed, he had to follow them. Inferna was very proud of her daughter, though puzzled as to just how she had gained such a fearsome reputation. For with the coming of spring, the power of Nivalis waned. She could not compete with the sun. The frozen ground thawed out, the trees broke into leaf, and Brand the blacksmith lit his forge again. By May, Nivalis had had enough. She was too hot, and she was tired. So she flew to the high mountains in the west, and crept into the cavern, which was now silent, cold and empty. She lay down in the dark with a deep sigh of contentment, and closed her eyes. In Little Toft, life returned to normal. The villagers re-thatched their roofs, counted their sheep and stored bushels of grain. There was much singing and merriment at harvest-time that year. But Walter watched the leaves, waiting for the first rusty tinges to appear: waiting for the wind to change to its northern, wolfish howl: waiting for a grey cloud full of snow to sweep across the chilly sky and turn into a dragon.